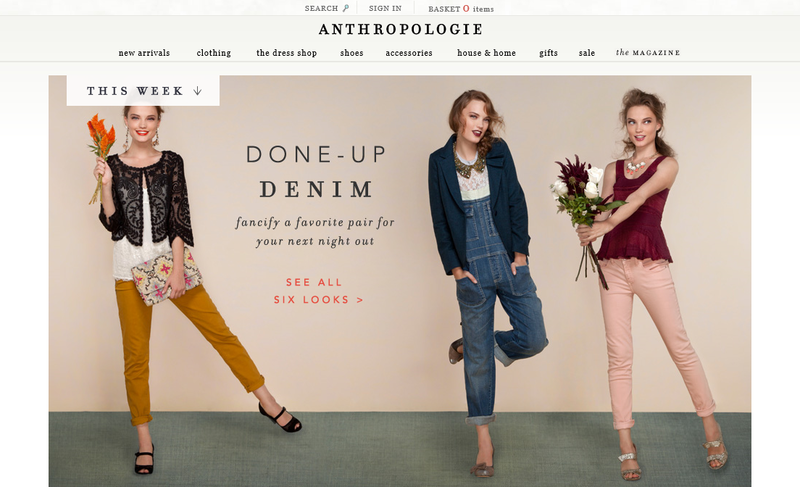 Anthropologie.com is the online store for Anthropologie , a retailer that deals in women’s apparel as well as home furnishing and other miscellaneous items. Headquartered in Philadelphia, they have been in business since 1992. The first page presents a large picture of models wearing outfits of promoted store merchandise and a link to see more in that category. On the top left edge of the picture is a bar labeled “This Week” which drops down to display other promoted merchandise categories for that specific week. At the very top is a bar containing links to search the site, sign in, and a shopping cart labeled as “Basket.” The second line has links of different categories of Anthropologie’s merchandise, one for sale items, and another for the magazine which is much like a blog displaying outfits and other collections. The website theme is of soft pastel colors. The target audience is the artsy, middle to higher income earning adult woman with a niche taste. Since merchandise includes furniture items as well, the target should be women who own or live in their own homes. The goal is to supplement their physical stores revenues with the convenience and accessibility of an online store. A social media panel is displayed at the bottom of all the pages and includes Pinterest, Facebook, Twitter, YouTube, and tumblr. The pages on this site use the Java Server Pages format. There is a shopping cart that has been labeled as “Basket” to appeal to the target market.